Moscow, February 2018 - TM Choupette presented new fashion collections of the spring-summer season 2018, as well as a collection of school uniforms at the exhibition. From 19 to 22 February Choupette traditionally participated in one of the largest events in the field of children's retail, the exhibition "CJF - Children's Fashion-2018. Spring". The Choupette booth exhibited new fashion collections of the brand. Romantic Fleur de Paris, carefree Montpensier, daring Golden Kids - are for girls, and Aviator and Freestyle are for boys who love sports and adventure. The collection Special occasion unites the most interesting images for solemn events. Lush, but laconic hem, voluminous decorations, lace and appliques make Choupette outfits inimitably expressive. Models for boys are light suits made of cotton and linen, elongated shorts of classic cut, club jackets that look elegant and non-trivial. Separate attention deserves the design of the stand. The original approach to the design of the stand was appreciated by participants and visitors. A unique symbol that unites all the new Choupette collections of the spring-summer season 2018 are balloons - the embodiment of lightness, the atmosphere of fun, the pursuit of travel and discovery. The company also demonstrated for the first time at the exhibition the innovative idea of creating showcases of branded boutiques, which it plans to introduce throughout the year. 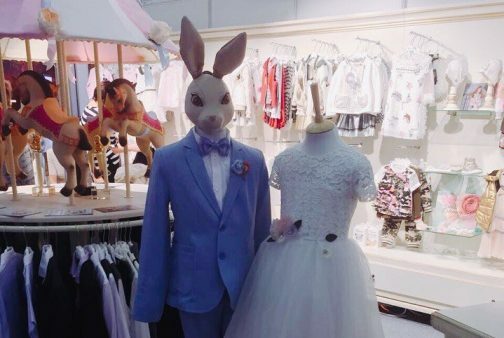 Mannequins will be decorated with animal masks, the bright and kind look of which will become a kind of emotional magnet for buyers with children.